Today's cartoons continue the saga of Mayor Harper on Tour. You may remember from the first pair of cartoons posted two weeks ago that this Herriman series concerns the trip Los Angeles mayor Harper and friends made to scout likely new sources of water for their burgeoning city. 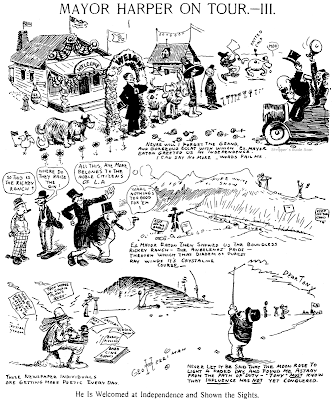 In the first cartoon above, printed on April 22, Harper meets with former L.A. mayor Fred Eaton, an engineer who was the first to seriously propose the building of a water system with the Owens River as its source. For more on Eaton see this page. 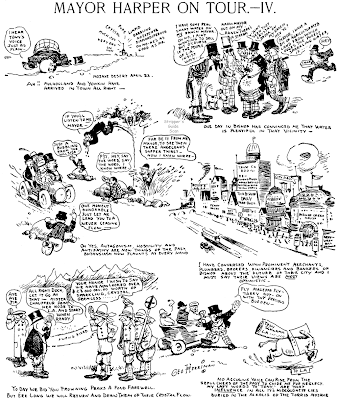 The second cartoon, printed on the 23rd, lampoons the big-city dreams of the little town of Bishop, California, which is in the Owens Valley. Bishop's dreams might have been big, but reality never caught up with them. Population today is less than 4,000. The idea for Max Horne's new household hints comic strip, "The Handy Homers," distributed by Editors Syndicate, grew out of an advertising campaign. From 1949 to 1951 Mr. Horne created a series of ads for the American Home Magazine to run under the title "Some People Can't Think of Anything But Home." The ads embodied do-it-yourself suggestions for household gadgets, and when the campaign ended Mr. Home decided to launch a newspaper feature. Mrs. Horne, who acts as the artist's agent, landed the syndicate con­tract. Now in its third month, the fea­ture is drawing comparatively heavy reader response. 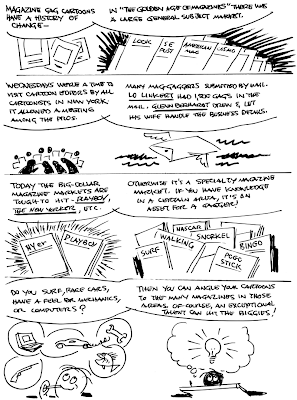 An offer of $2 for usable ideas brings many suggestions, some illus­trated, most usable. But Mr. Horne admits he'd really rather use his own ideas, of which there is an apparently inexhaustible supply. Mr. Horne began his art career in his native Germany. In 1933, when he was 17 years old, the Berlin magazine Gebrauchsgraphik, a publication dealing with international advertising art, commented on the "remarkable precision and perfection of his execution, down to the minutest detail." His U. S. work has included creation of the Chiqita Banana advertising campaign, childrens' books, travel folders, and a recent series of Schaefer Beer ads for newspapers. Harold Knerr had a habit of copying successful strips. 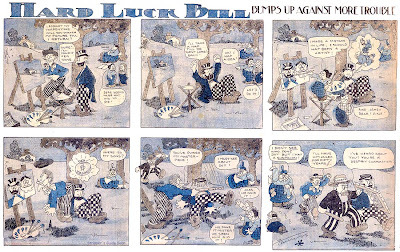 It was his long-running Katzies-clone The Fineheimer Twins strip that served as his portfolio when it came time to replace Rudolph Dirks on The Katzenjammer Kids, and here he is in 1903 at the Philadelphia Inquirer doing a bald-faced copy of Happy Hooligan called Hard Luck Bill. 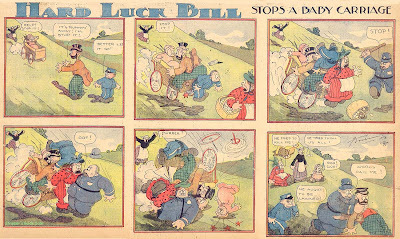 Hard Luck Bill started out as Hard Luck Willie on February 22 1903 but the title was changed to its final form on April 26 1903. For unknown reasons Knerr didn't sign the strip until June 14 of that year. The strip ran until January 3 1904. The examples above originally ran in the Inquirer on October 4 and 25 1903. Of special note here is the second example which features a crossover appearance with The Fineheimer Twins. Hail, hail, the clones are all here! A tip of the tomato can topper to Cole Johnson who supplied the scans of these samples. Thanks Cole! For my money one of the most beautifully drawn comic strips ever to grace the funny pages, Bronc Peeler was created and self-syndicated by Fred Harman. Depending on who you believe Bronc Peeler first saw the light of day late in 1933 (Goulart) or in 1934 (Horn). My earliest examples are from mid-1934. Harman brought to his new western strip a deep understanding of the subject having spent his own youth on a Colorado ranch. His client list consisted mainly of small western U.S. newspapers, although he did manage to snag a few big clients (like the San Francisco Chronicle and the Philadelphia Record). Bronc Peeler was that most unusual breed of self-syndicated strip in that Harman offered a Sunday page, a full-page extravaganza that featured the half-page topper On The Range, a series of breathtakingly lovely ink 'paintings' of western scenes. The Sunday page was added on October 7 1934. The genius of this strip was usually well-hidden. Most of the papers that ran the strip being small outfits, the reproduction was typically awful. If you see the strip in these papers it looks for all the world like Harman was a complete washout as a cartoonist -- his delicate impressionistic linework was quite effectively turned into a sea of mud and dropouts. To be fair, Harman's art sometimes was rushed and the art on some strips is not up to par, but when he was on his game, look out-- his chiaroscuro technique was every bit as vibrant and predates the celebrated innovations of Noel Sickles and Milton Caniff. Bronc Peeler was an adventure strip with a strong dose of comedy. The daily continuities dealing with gunslingers, cattle rustlers and such were leavened by Bronc's pal Coyote Pete, and then later by a Lilliputian indian brave named Little Beaver. The comedy tended to undercut the adventuring, but ended up working out well for Harman. In 1935 Western Newspaper Union approached him (or he approached them -- the specifics are lost to history) to redistribute the dailies as part of their comic strip package for small weekly papers. Not being able to sustain a narrative on a once a week basis, Harman's comedy dailies were used by the service to their substantial client list. Once again the reproduction quality was horrifically bad, but it did get his strip into a vastly larger client list of papers. WNU used Bronc Peeler from 1935-37. Harman continued the daily to his regular client list, occasionally signing up a new paper here and there, and in 1937 finally signed on with a syndicate. Starting with the daily of April 26 Harman was now syndicated by the John F. Dille Company (the syndicate responsible for Buck Rogers among others). Unfortunately the syndicate seemed to have no better luck selling the strip than Harman had himself, and by 1938 Harman was ready to throw in the towel. The Sunday was dropped on April 10 while the daily moseyed on until July 2 (both these dates are, of course, quite tentative given the rarity of the strip). It is not definitely known if Harman met entrepreneur Stephen Slesinger before or after he gave up on Bronc Peeler, but the smart money says that Slesinger probably convinced Harman to drop Bronc Peeler so that Slesinger could act as his agent in reselling it to a major syndicate. Slesinger is justly famed for his wheeling and dealing ways (quite possibly the most charitable way his modus operandi has ever been described) and he acted as Harman's intermediary when the reworked strip, now titled Red Ryder, was sold to NEA. Slesinger wrote up a contract in which Harman was little better than a hireling, and the vast success of Red Ryder did much to line the pockets of the impresario but little to benefit Harman other than giving him steady work. Harman's brother was Hugh Harman, of Warner Bros. and MGM cartoon fame; as it happens, I wrote the entry on Hugh Harman for the Oxford Dictionary of American Biography. Bronc Peeler appeared in early comic books (from around 1936 to 1940) The Funnies and Popular Comics. Move over, Mandrake! 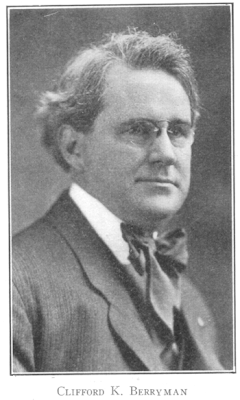 Way back at the turn of the century Ed Carey played the hypnosis schtick for laughs in Professor Hypnotiser. Although the professor was eminently successful at clouding men's minds he'd invariably get hoist by his own petard as in this sample. Ed Carey had a long career and was a top-notch cartoonist and gag man. After getting his comic-stripping feet wet at the Chicago Daily News he soon moved on to the bright lights of New York City where he did much of his work for McClure, as is the case with Professor Hypnotiser which ran sporadically between February 1 1903 and July 23 1905. 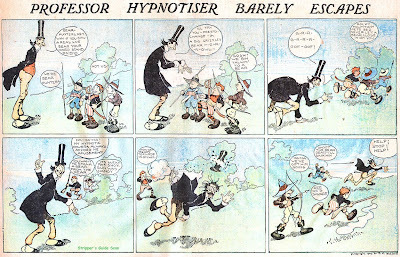 Carey often didn't bothered to sign his strips, but his delightfully playful style is impossible to mistake. Is the cartoon losing its popularity? 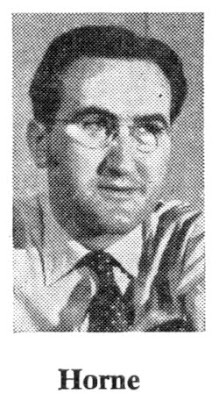 With his long experience as cartoonist on the Washington Evening Star, Clifford K. Berryman ought to know if anybody does, and he says emphati­cally no. "If it is passing I am in the wrong pew to know about it, for .hardly a day dawns that I am not importuned to make cartoons for various causes," he de­clares. Warming to his subject he continued, "Waning cartoons, eh? Why, even the few practically pictureless papers that refuse to indulge on week-days always have a generous sup­ply on Sunday and they are good ones, too. If Leon Trotsky lives long enough to do what Bill Hohenzollern failed to do a few years ago, we may see the car­toon's career curtailed and crippled; or if Mussolini, in the coming years, should rule the world from Rome, that might indeed put the cartoonist on bread and water; but those contingencies are not immediately threatening. "No! While Uncle Sam and John Bull sit at the Civilization Conference Table, the cartoonists can eat three square meals a day and enjoy a mild beverage for a nightcap. Some of them may even con­tinue to indulge in an eiderdown quilt occasionally. Struggle to get a strangle hold on any street car strap - glance around and see if your fellow passengers are reading the cold type stories. They are not. It's the comics and the cartoons that their noses are rubbing." Mr. Berryman's blue eyes twinkled. As he sat defending his chosen form of ex­pression, he himself made a striking picture. Thick, wavy white hair over dark brows, periwinkle blue eyes, broad shoulders, a hearty laugh - that's Berry­man. A vivid personality. Small wonder that many of the most distinguished men in Washington journey up to his little office on the seventh floor of the Star building to talk to him or lure him out for a game of golf. It is characteristic of the man that he never caricatures a face, confining his ironic treatment to the bodies of his subjects. This is in sharp contrast to some of his colleagues who distort the features to the point of grotesqueness. Not yet have we for­gotten Harding's jungle eye-brows as portrayed by Herbert Johnson. As a cartoonist at the National Capital for some 35 years Mr. Berryman is in a position to feel the pulse of the people and to know whether their interest in pen-pictures is abating. "If it is," he says, "the men and women I have been meeting for a third of a century are all eligible to T. R.'s famous old Ananias Club. Presidents, Vice-Presidents, Speakers of the House, members of the Cabinet and of both houses of Congress have been, straight through, puffing me up with the impor­tance of the cartoon in moulding public opinion and in pointing out facts and fallacies. "Right now, assuming that Washing­ton may not be the first place to realize the decline of the dear old cartoon, re­member that representatives of every constituency of Uncle Sam are here and evidently they feel no weakening of this medium 'back home' for they still claim that a good picture is a supreme asset in any strenuous campaign. "What can a cartoonist tell the public that a writer or photographer cannot tell? Let us take the lazy man-and there are such!-or the weary business man after a hectic day. His eye travels first to the cartoon, for it is the striking current event, the outstanding feature of the news, served up to him in a con­densed and arresting form. His interest is aroused by it, then he reads. "I remember," laughed Mr. Berryman, "that as a youth down on the banks of the Kentucky River, my native heath, the only picture that ever appeared in our weekly paper, was a Syrup of Figs ad. I used to try not to look at it, but it stood out like the Washington monu­ment on the 15 or 20 pages of cold, monotonous type. "Just print the best stuff produced by Will Rogers, Irvin Cobb, Ring Lardner and the score of other clever paragraphers alongside a cartoon by Darling or Sykes or Johnson, and see which will get the first attention. I am putting my filthy lucre on my pictorial colleagues. I have often studied and greatly enjoyed news photographs, but none of them have ever been as full of thought, and as comprehensive, as the productions of the cartoonists. Nay, nay. We may revert to the hoop skirt, to the long street clean­ing costume feminine, we may even go back to the one-horse shay-aye, we may return to the dog sled for polar pleasure trips; but we won't retrograde to the pre-cartoonist era." Mr. Berryman then referred to the fact that 35 years ago Punch, which has been one of the great influences in de­veloping this form of art, celebrated its fiftieth anniversary. Fifty years of pic­torial progress! And today, as that great English comic nears its centennial, it is stronger and better than ever. Thomas Nast, who was the pioneer car­toonist in America, conducted a terrific tirade against the Tweed thievery which is still vividly remembered. Nast has passed on, but where he practically stood alone, an army of artists now carries on his fight for pitiless publicity. Mr. Berryman thinks that the syndi­cates have helped the cartoon in giving the general public a chance to become familiar with the work of the great mas­ters of the cult. Small towns, where cir­culation does not warrant the services of a special artist can now obtain the work of well-known men. Through the syndicates cartoons can be produced at approximately $2.50 a day where they would cost from $25 to $50 if drawn for the paper alone, Berryman said. "No," repeated the cartoonist, shaking his impressive head, "the cartoon is not dying as long as the work of such men as Herbert Johnson, who reaches 2,000,000 through the Saturday Evening Post each week; as John T. McCutcheon, known by everybody in the mid-west who can read; as Jay N. Darling, one of the greatest cartoonists that ever lived; as C. K. Sykes, of the Philadelphia Public Ledger and Life; Billy Ireland, Colum­bus Dispatch, veteran at the game; Rollin Kirby, of the New York World, up-to-the-minute cartoonist; B. R. Fitzpatrick, St. Louis Post-Dispatch; ]. H. Dohaney, Cleveland Plain Dealer, clean, good, snappy; Edwin Marcus, of the New York Times; W. A. Rogers of the Washington Post, for years on Harper's Weekly, dean of American cartoonists, who has been doing this thing for 40 years, continue to retain popularity." The speaker modestly refrained from including his own name though his life is an outstanding example of achieve­ment along this line. He was born April 2, 1869, in Woodford County, Kentucky, one of 11 children. He lost his father at the age of ten. His advantages were few but his talent, and doubtless his per­sonality, too, caught the attention of Senator Blackburn of that state, who brought him to Washington and placed him in the drafting division of the Patent Office, where he was thoroughly trained in mechanical drawing. His life ambi­tion, however, was to become a car­toonist. In realizing this ambition suc­cess has come to him. In 1921 George Washington University gave him the honorary degree of Master of Arts. He is now president of the Gridiron Club, limited to 50 newspaper men, with mem­bership for life. Mr. Berryman is the first cartoonist who has been president. To many he is best known as the orig­inator of the "Teddy Bear."